Knight Rise by James Turrell is a permanent installation at Scottsdale Museum of Contemporary Art. I embark on a mini journey to enter Turrell's "skyspace", first traveling along a narrow, curving path at the edge of SMOCA's small, minimalist courtyard, passing a few modern sculptures and desert plants along the way. The courtyard wall, composed of panels of subtly glistening irridescent glass, is the Scrim Wall by James Carpenter Design Associates. Knight Rise is a simple, oval-shaped room formed out of concrete, with a single entryway, a built-in, curved bench that goes all around the room, and a ceiling with a central elliptical opening to the sky. The ceiling and the top part of the walls are whitewashed. The skylight, open to the elements, is the primary source of light. On the day that I visited, the light from the sky was filtered by filmy clouds and evenly dispersed throughout the room, reflected by the pale upper walls and ceiling. Turrell has created a space that feels like an inner sanctum, secret and sacred. With its gentle curving shape, being within this space is like being inside an egg, or a seed, or an earthen pot. It feels light, clean, and serene. What is it about a round space, without angles, straight lines, or dark corners, that creates a paradoxical feeling of enclosing embrace and protection, while at the same time, openness and freedom? There is a sense of timelessness here. In its simplicity and starkness, it could be an ancient space, or it could be ultra-modern. 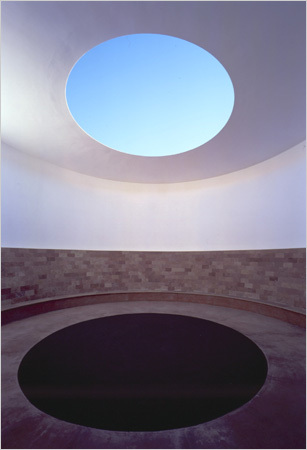 Turrell says that he has been influenced by Tibetan and Hopi kivas. As a pilot of small planes, the sky is his element. This could be a sacred space, ideal for prayer, song, contemplation or meditation. The oculus to the sky, and the light colors surrounding it, create an upward focus, allowing me to watch the changes of the sky through this porthole. The partial ceiling blocks most of the sun's glare, so it is easy to watch the movements of the clouds and birds above. An optical illusion occurs. 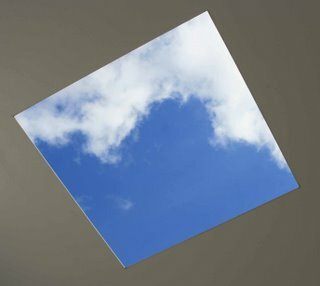 The sky, contained in this oval outline of skylight, appears to take on a convex form, as if it is gently pushing into the room, like a bubble with the ceiling receding above it. This oval of sky enters and expands, to meet my gaze halfway, inside of the space. It seems as if I could reach out and touch it. On the day of my visit, I witnessed a rainbow, curved upside-down like a smile. Through this porthole, all human concerns are lifted, as focus shifts to the floating sky above. A sense of peace and serenity fills the emptiness. Knight Rise is an uplifting experience. Although you may not travel anywhere, a transformation takes place. 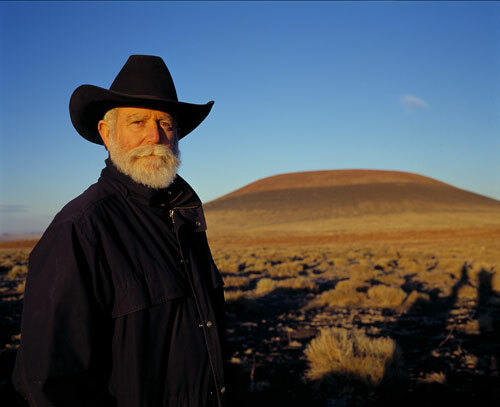 James Turrell is an American artist based in Arizona. He is best known for a monumental work in progress that few people have ever seen: Roden Crater, an extinct volcano near Flagstaff, AZ that, for 30 years, he has been carving into an observatory of light, atmosphere and celestial phenomena.